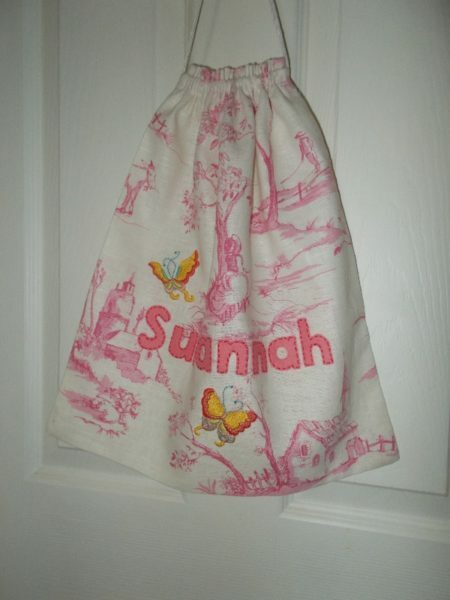 Two shoe bags for a brother and sister. 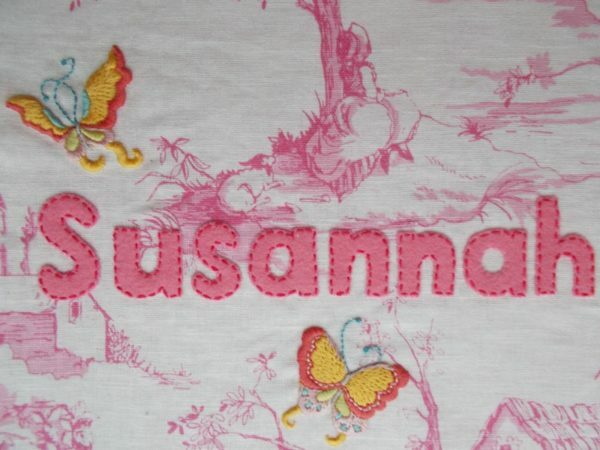 Loved doing the butterflies which started as appliquéd felt and ended up being completely covered in embroidery. 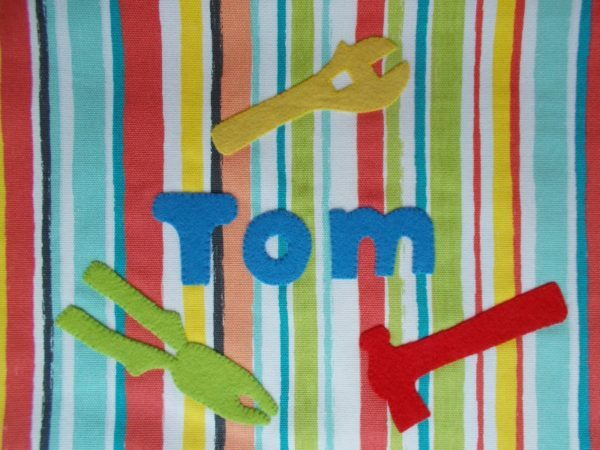 Simple appliquéd felt tools were appropriate for the boy recipient. 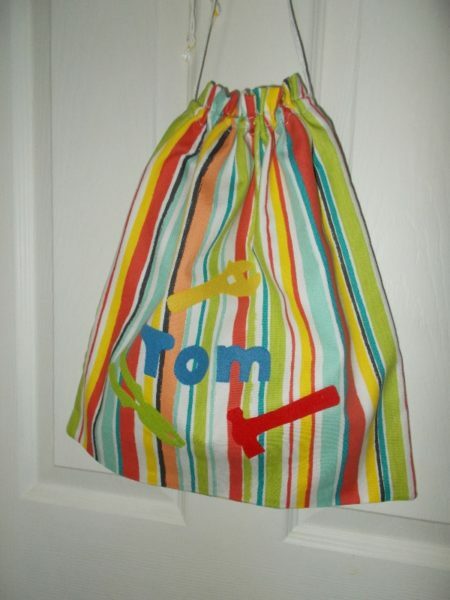 I know from my grandson’s shoe bag the felt washes well on an ordinary coloured wash, so the bags should stand up to a certain amount of wear. We’ve had an indulgent time – for me that meant day time sewing by the bedroom window while the light was good, followed by evenings of knitting in front the the television or the various catch up channels on the laptop. This is regularly followed by my reading for a couple of hours as one day changes into the next. At the moment I’m feasting on my happy charity shop find of a book I’ve been after for ages, the novel, This Thing of Darkness by Harry Thompson. British readers may remember Thompson as the first producer of Have I got News for You, from its beginning in 2000 until just before his early death from lung cancer in 2005. His first, and only, novel is about Robert Fitzroy and Charles Darwin on board The Beagle and at 600 plus pages is a brick of a book. The first hundred pages describe the Beagle’s first eventful voyage under Fitzroy’s captaincy, brilliant and stern seamanship, early practical weather forecasting, ‘adoption’ of 4 native Tierra del Fuegans and the first hints of the mental illness that was to, much later, claim his life. Darwin only sailed with Fitzroy on his second voyage and, accordingly makes his first appearance in the novel only around page 100 which is where I am at the moment. Much more to enjoy! I’ve not managed as much stitching as you, but I’ve done a little, and I’m revelling in the exotic sounding names of the Merovingians and Visigoths as I read Chris Wickham’s The Inheritance of Rome! It’s nice to be ale to have a bit more time to get into a long book, isn’t it? Oh yes this is a splendid book! Unknown to me until it was chosen by my book group. What an ambitious choice for a book group – 600 plus pages between meetings would have been about 400 too far for the reading group I used to belong to in Ipsden! But I’m really glad it’s not been forgotten.